This article is a Church logo design process for my recent logo for St Michael and All Angels Church, Solomon Islands. I was approached by Mr Saloouou of St Michael and All Angels Church, Solomon Islands, to design a logo for his church. You can see a preview of the final logo above. Where are the Solomon Islands? 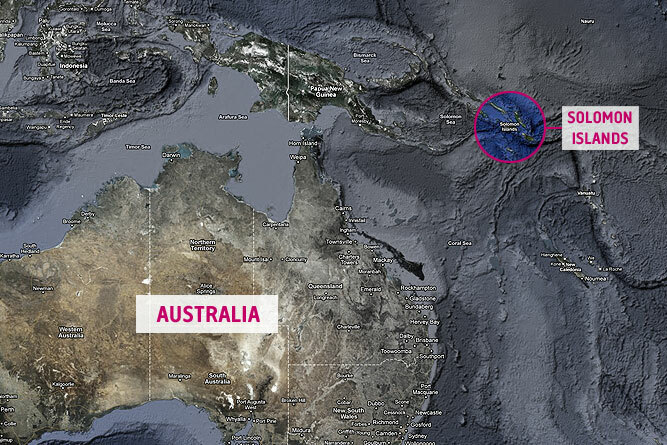 ↑ Australia and Solomon Islands map. Base image taken from Google Maps (copyright © Google). Mr Saloouou and the church were very specific in what they wanted, even the colour. They required a logo that showed St Michael and his Angels. The colour pink was also to be used. With this basic information as a springboard, I set to work creating mockups. Concept 1 (top-left image): This logo design uses all-capital letters to form the name of the church and location. This helps give the design a sense of authority and boldness. The angels icon used is only a sketch at this point, but it represents how the design would look as a whole. Concept 2 (top-right image): This design is more modern looking. The icon (represented by a rough sketch) is very simple, showing a lead angel with a few flying ones in the background of the circle. The typography is very modern, and in title-case. The whole idea around this design is ‘simplicity’. Concept 3 (base-left image): This design, again, uses all-caps in the title and church address. The sketched icon here shows an angel (which is St Michael) yielding a sword. Other angels can be seen behind. 2 curved icons are used above the text to promote a more traditional appearance. Concept 4 (base-right image): Unlike the other concepts, this logo is a more complicated emblem. The name of the church and address information is contained within a more detailed image of St. Michael and his angels. Out of these logo sketches, logo concept 4 (base-right image) was taken further, but with the typographic treatment of concept 3 (base-left image). As can be seen in the last example above, St Michael the Archangel is stood with a sword ready for battle. When I was designing the original logo sketches, I used a combination of computer and sketching. Firstly, I designed a very basic logo in Adobe Illustrator®, then printed them out. I then used black pen to sketch over the light-grey outlines of the logo, adding additional detail. Them I scanned the images back-in to my iMac, then imported them into Adobe Photoshop®. The final step was using Alpha-channels to under-colour the logo with grey to simulate marker pen. I’m plan to dedicate a whole post to this method of sketching logos, so be sure to Subscribe to my Free RSS feed so you don’t miss it. Even though the colour suggestion was pink, I also thought it prudent to show how the logo would look in other colours, such as blue and gold. I also supplied a grey-style version. Final logos included Pantone® Colours. Unlike some other projects I’ve worked on, the client here had a very clear idea of what was required. The culture is the Solomon Islands is quite different to what it is over here in England, UK. I trusted that what was required—especially the colour-scheme—was suitable for a church over there. I know this isn’t an exact science here, but I also did some ‘research’ by way of looking at the types of structures and existing street signage by using Google Street-View. I once did this when looking at the surrounding church area for a logo for Harrowgate Church. This at very least gave me a slight additional information to add add to my mental arsenal of ideas. Good post. Thanks for sharing your process. I am very impressed with this level of freehand sketching, as that is not one of my strengths. (I have an embarrassing set of posts with sketches on my blog…) The logo process was really great to see from concept to design. Thanks for sharing! Quite a change of style for you Andrew. Your logos seems to be becoming more illustrative. I’m loving the purple colour, very vibrant and quite a change from a lot of church/religious logos. Anywhere we can see the stationary larger? Brian → Hay, don’t forget that these sketches aren’t totally freehand and I “cheated” by printing guide shapes first, hehe. We all get better with practice, though. Paul → I see what you mean about “illustrative logos”, but these projects seem to be pouring in at the moment; ones where the client has a clear idea in mind. Although, I do try to put my own stamp on things. I’m also doing another emblem-style logo at the moment for a railway company. Process to come. Paul → Oh, about the stationary – I’ve only included small versions for now as the client won’t be supplying names and address’s for some time. So, they just wanted them designing and ready for implementing when need-be. I’ll post some larger versions in my portfolio at a future date.